Can you help me with my CV, resume or cover letter? Studiosity can help with your CV/resume or job application. 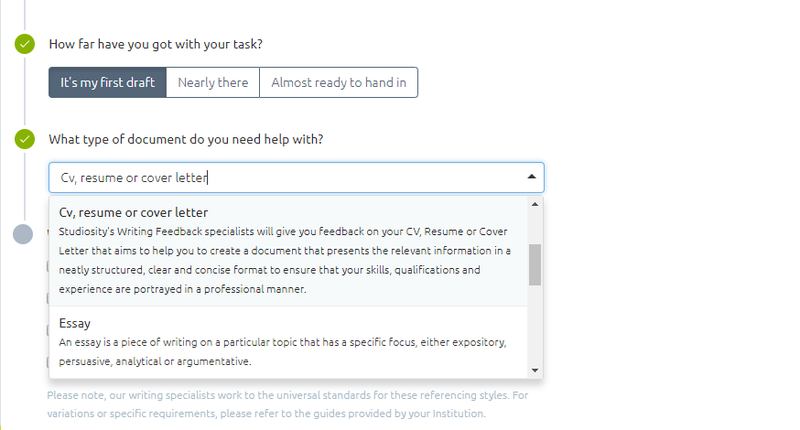 You can submit your CV or resume to our Writing Feedback service - simply select the option 'CV, Resume or Cover Letter' under the 'What type of document do you need help with?' menu. As usual, you'll then receive fast, helpful feedback on your spelling, grammar, punctuation, structure and clarity of presentation, via email to help you improve your document. Our specialists are unable to comment on the content of your CV/resume, or its appropriateness for any particular role. Instead, what they can provide is feedback to help you present the relevant information in a neatly structured, clear and concise format. You can submit cover letters individually, or together in the same document as your CV. We will run a word count on your document and your minute balance (if you have one) will be deducted accordingly. Many of our library partners offer live help in this subject to their members. To access this, simply log in via your library, click 'Ask a question' button during our open hours, and select the subject 'Job Skills for Adults'. See a list of our library partners here.